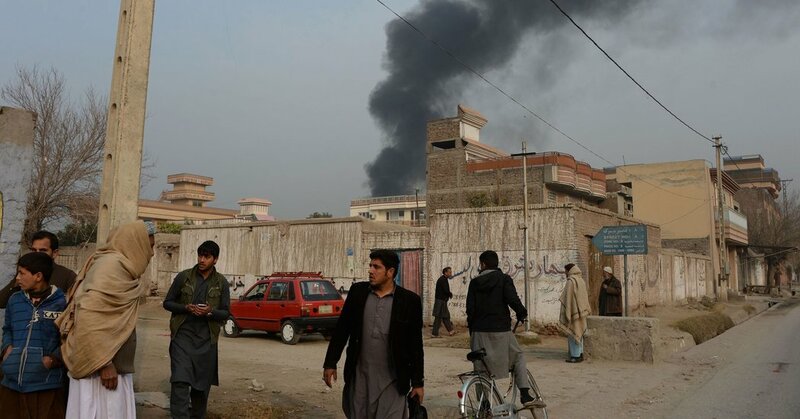 Afghan civilians gathered Wednesday in Jalalabad as smoke billowed nearby. An explosion outside Save the Children’s office in the city was followed by a lengthy siege. JALALABAD, Afghanistan — Gunmen stormed the office of Save the Children in the eastern Afghan city of Jalalabad after an explosion on Wednesday morning, officials said. Fighting was still going on hours later, with at least one person killed and 12 wounded, an official said. “At 9 a.m., a suicide attack took place in front of the Save the Children office, and some vehicles belonging to the organization caught fire,” said the official, Attaullah Khogyani, a spokesman for the governor of Nangarhar Province, which includes Jalalabad. People fleeing the scene of the attack. The pace of violence in Afghanistan has been relentless in recent weeks. Nearly three hours after the attack began, gunfire was still being heard as police special forces tried to end the siege. Mr. Khogyani said four attackers were involved, though a security official put the number at three. The official said that two of the attackers had been killed, and that they believed one was still resisting in the British aid agency’s offices. Officials said that the Jalalabad office of Save the Children, which works on health and education issues, shares a wall with another aid organization, Swedish Committee for Afghanistan, and that the Swedish group’s staff had been evacuated. No group had claimed responsibility for the attack, and the Taliban issued a statement denying that they were involved. Save the Children’s main Afghanistan office said it was “devastated” about the assault and was awaiting further information. We are devastated at the news that our SCI office in Jalalabad city, Afghanistan came under attack this morning. Our primary concern is for the safety and security of our staff. We are awaiting further information and cannot comment further at this time. Vehicles ablaze outside the aid agency’s office. An official said the attack began with a suicide bombing. The pace of violence across Afghanistan has been relentless in recent weeks, with civilians bearing the brunt. On Saturday, the Taliban attacked a packed hotel in Kabul, killing at least 22 people and terrorizing much of the Afghan capital for nearly 15 hours of fighting. Aid organizations have been targeted repeatedly in recent years, forcing some of them to cut back their operations. The Red Cross recently closed its offices in two northern provinces and scaled back operations in a third regional hub after repeated attacks targeting its staff. In the latest episode, one of its physiotherapists was shot dead as she was assisting a polio patient.